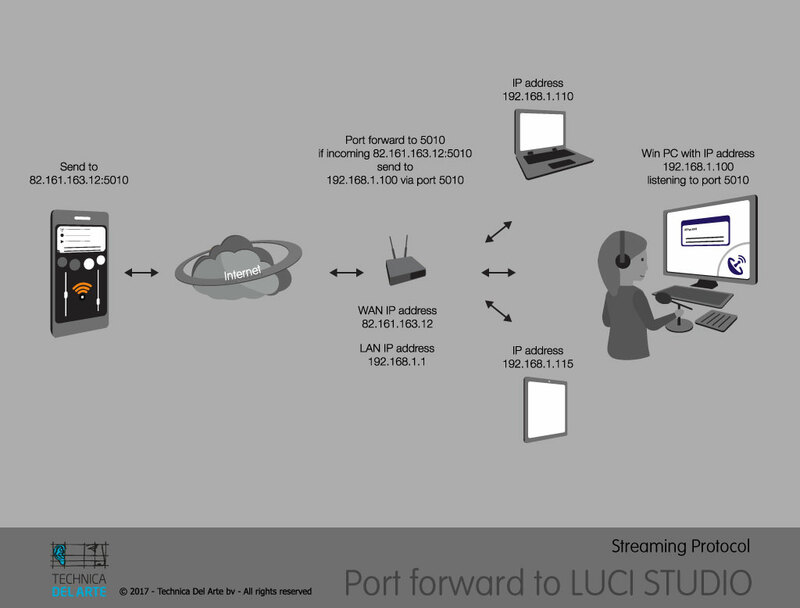 When an RTP stream arrives at the doorstep of your Studio, your Studio has to send the stream to the room and building where your copy of LUCI Studio, or a hardware codec, is running. In the above example that room nr is 5010 in Building 192.168.1.100. Coincidentally, the RTP stream also says it wants to go to Room nr 5010 (it doesn’t know which buildings there are in your studio). That’s easy, the Studio must be set to send the stream meant for Room nr 5010 to Room nr 5010 in Building 192.168.1.100. If your codec is later moved to a different Building and Room, say room nr 5046 in Building 192.168.1.58 you can simply set the Studio to transfer the stream meant for Room nr 5010 to Room nr 5046 in Building 192.168.1.58 and the codec will receive the stream. Now, exchange in the above paragraph “Studio” with “Router”, “Building” with “IP-address” and “Room” with “Port” and you will understand the concept of port-forwarding on your router. Read more about port-forwarding here. We will need to set up a transmission from an external device to an internal computer, connected to the internet via the router. Our external device is in this example an iPhone running LUCI LIVE software. The iPhone is connected to the internet via a 4G connection, the router is connected to the internet via ADSL. The receiving computer is running the LUCI Studio software. The WAN (external) IP address of the router is 82.161.163.12. The LAN IP addresses in our example start with 192.168.1. and the last numbers: 100, 110 and 115 are the specific numbers corresponding with the different computers. To be able to connect from the outside world to one specific computer in our internal network, the router should be set up to forward the incoming transmission to the right computer. To do so the router uses Port numbers. We have to configure the router to transmit (forward) the UDP transmission coming in via port number 5010 to the right IP address, in this example 192.168.1.100. After this setting is done, the router will forward all the data incoming on address 82.161.163.12 with the port 5010 information, the right address, 192.168.1.100. The returning signal will be configured automatically by the router to go from the PC to the iPhone. Note: Only the UDP protocol has to be port forwarded.